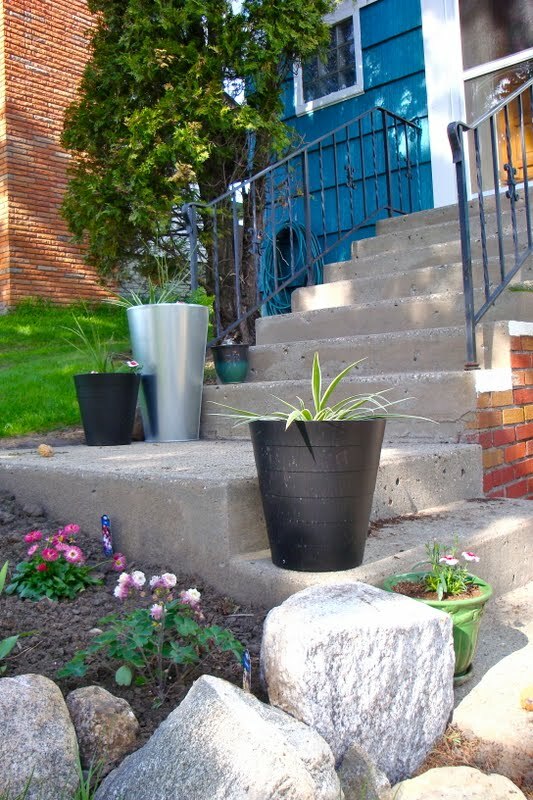 As promised, here are some photos of a recent yard project: beautifying the front stoop. 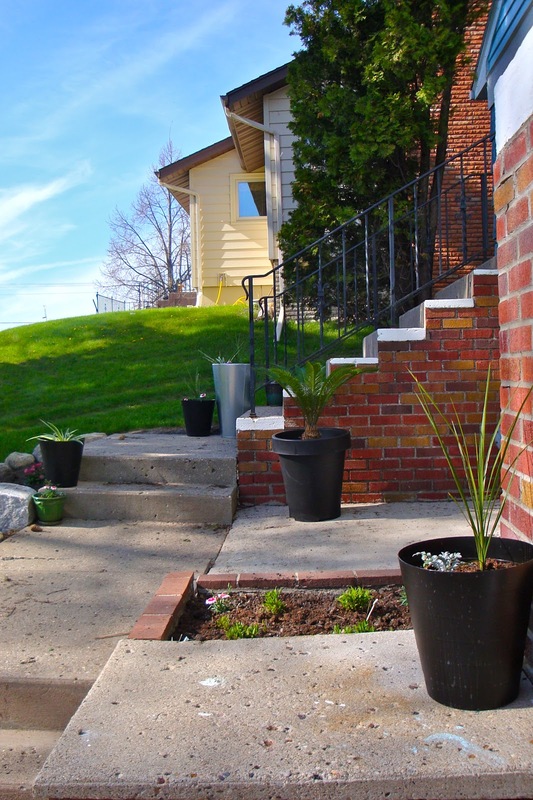 We'll be further increasing this spot's curb appeal by painting the step risers and railing. For now, we've added more plants. One step at a time I guess. Pun intended. Ha. 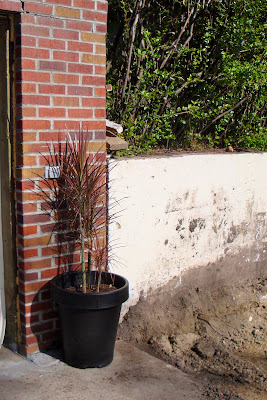 I took a cue from Bungalow Bungahide, picking up a few $1.99 black IKEA trash cans in addition to some planters when I was there lately--yes, I've been to IKEA again. A month ago, I had never been there. Since then, I've made four voyages shopping trips. Clearly, I'm hooked. And I'm totally ok with that. 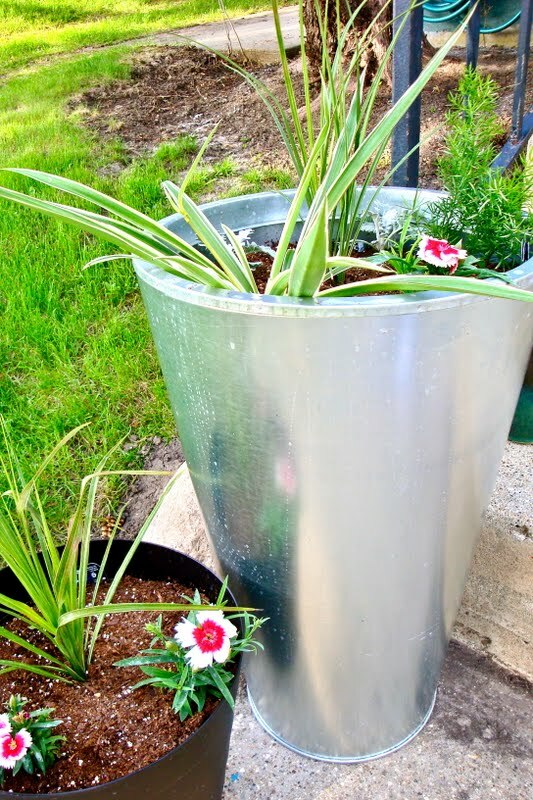 The galvanized planter was my splurge at $35. But I figured the trash cans-made planters made up for it. And it's far and away my favorite buy, so no regrets. I picked up most of my plants from Walmart. We're thrilled with all the color it brings after the long white winter. A couple of our plants are from a local greenhouse. We've been talking about getting some warmer weather plants ever since going to DisneyWorld last June. Plants that remind us of our honeymoon? Yes, please. Our second "exotic" (Ha. That's how the green house classified them.) plant sits next to our garage door--and the giant dirt hole that will soon be our extended parking pad. The plan is to take them to my office during the winter months. They can enjoy the electric fireplace heat during the months of blizzards. But let's not go there now. I also picked up some herbs while I was at Walmart. This year's goal is keep the cilantro from going into seed. Here's hoping. fun! I love Ikea. I've been dying to go shopping there again for a while, but I think my husband is afraid to let me go. =) I love the metal one you bought too! It really stands out. Hi! thanks for visiting my blog. It's nice to get to know a "neighbor". 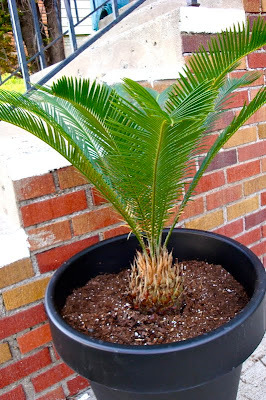 I like your sego palm. I visited my family from California and brought 2 of them home. I guess protected they can take our early spring temps, but need to come inside in the fall. I put my two in pots and will have them on the porch.